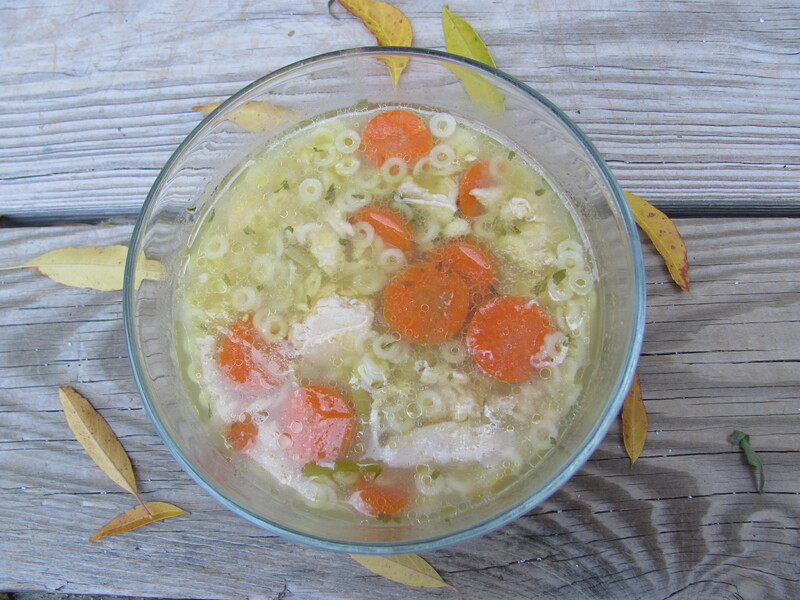 4 cups of chicken broth–Pacific is gluten-free. You can buy it in bulk on amazon. Pour the broth into the pan. Turn the heat to medium high. (It’s about “8” on most U.S. stoves.) Chop the vegetables right into the pan. When the water boils, add the anellini and stir, constantly for about a minute. Turn the heat down one mark to just above medium. Set the kitchen timer to twenty minutes. Add the spices. Stir the soup occasionally, making sure it doesn’t burn. The anellini will take at least fifteen minutes to cook, because the salt in the broth slows down the cooking time substantially. (The extra cooking time and the anellini will make the broth thicken all by itself.) When the kitchen timer says you have four minutes left, open the can of chicken, drain it, and then add it to the broth to warm. Finally, in the last two minutes, add three tablespoons of vegetable oil, and stir. Take the soup from the stove and salt it a little more before serving. Soundtrack: “Thistle and Shamrock” on NPR.org. You can replay the last three shows to go with your melancholy winter mood.